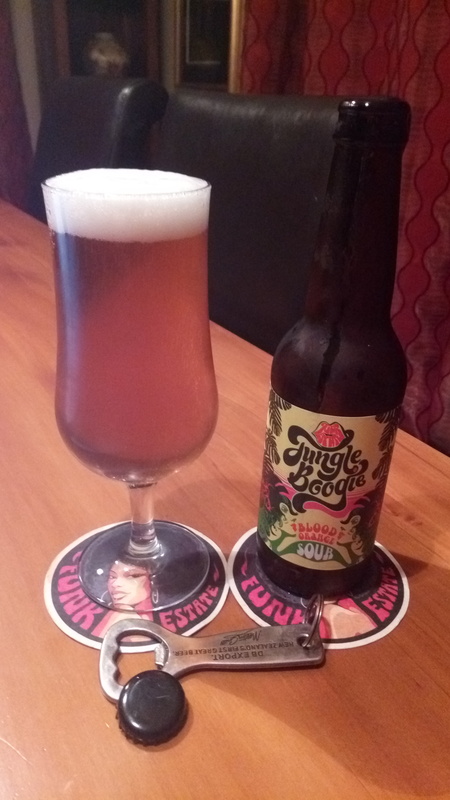 The very short journey (of two beers) must end then with the Funk Estate Jungle Boogie a Soured Fruit Beer, this is another Soured beer. How unusual, not, and not faddish at all, and I have little expectation. I’m cruel but not heartless and I hope this is better than I’m pretending I’m hoping it’s not. This is a beer that has 159 calories a serve size in a 330ml bottle that has beer of a 5.3% ABV, making it 1.5 standard drink units. With blood orange, lemon and passionfruit, forget what you know about beer and just embrace the sour fruit characters. Tangy, sour beers have evolved with the craft beer revolution and some real tasty concoctions have made an appearance. Blood oranges, passionfruit and lemons were sacrificed to bring you this tarty sour. Upon first sip, they’ll be all up in your taste buds to remind you. This has the aroma of passion fruits, my go to aroma :-), and some green hops, it’s quite nice. It has a strange colour pour, almost pink tinted, certainly towards red, and it looks lovely in the glass with that lovely white fluff atop. Aroma in the glass is a dull hops. Wow, that’s a get your attention amount of sour eyes squinting flavour burst. That’s rally full and rich in the body with that wrapped around sourness that is tangy and tart and not at all weird. Well a bit weird but also a bit familiar. Orange then. Sort of, yes on the level that you know because it’s orange because it says it is, but really it’s not that obvious. However this does have a magnificent amount of sweetness that is a nice balance to that sourness. I’m not saying that this is how a sour beer should be, because I really I am not a fan of sour beers, but in an unasked option this is quite a nice sour beer. I finished it without a really bad thing to think about it, it’s a pretty nice sour beer, but it’s just a sour beer, and I won’t be fan, and I’m not following a fad because that’s even worse. The pdubyah-o-meter rates this as 7 of its things from the thing. Of the recent sour beers, and I haven’t had many, this one is pretty nice, and I might even suggest it to someone if I was asked about what one to try, I think though that’d be the sweetness rather than the sour that made me like it. Am I enjoying it? Sort of, it’s not so bad. Would I have another? Not really I don’t think I’d ever really enjoy it. Would I share with a friend on a porch and set the world to rights? For me it’s a not. But then of the sours, if I had my arm twisted, this might be the one. Minor Victories are a British alternative rock supergroup, formed in 2015. Is it fair to say the entire GABS six pack isn’t working out? I’m sure the last 3 will be brilliant, you just can’t like every beer. This is very true. A Beervana six pack may have a similar outcome. I guess at a beer event you don’t generally get the full glass experience and there is a certain amount of ‘excitement’ about something, in the cold light of day it might not be the same. I’d still drink them thought, far too much beer to drink the same thing twice. 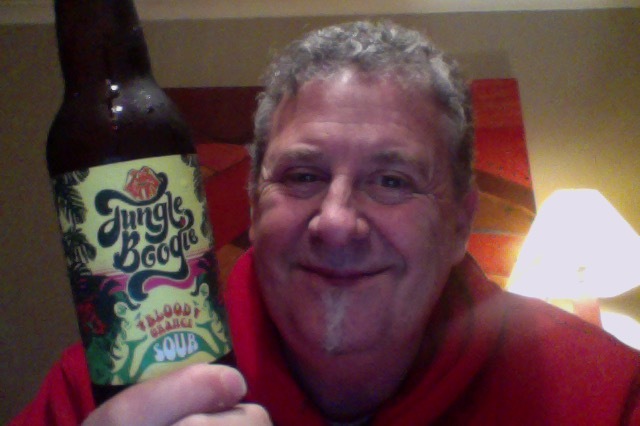 This entry was posted on July 15, 2016 by Philip Walter in Beer, Beer of New Zealand, Beer Review, Craft Beer, Critic, Funk Estate, Justsaying, Sour/Wild Ale and tagged craft beer, Funk Estate, Funk Estate Jungle Boogie, Jungle Boogie, Jungle Boogie Blood Red Orange Sour.